YPDA Hawaiʻi supports legislation aimed at safeguarding the public from potentially harmful Restricted Use Pesticides currently sprayed in high volumes in certain agricultural areas of Hawaiʻi by multinational corporations. Currently, this means mandating buffer zones around sensitive areas like schools, hospitals and residential areas, as well as mandating that these corporations disclose to the public which chemicals they are spraying, how much, and when. Critically, this disclosure must be made before the chemicals are sprayed, every time they are to be sprayed, instead of the current once-per year voluntary "Good Neighbor" policy which does little to protect public health and safety. 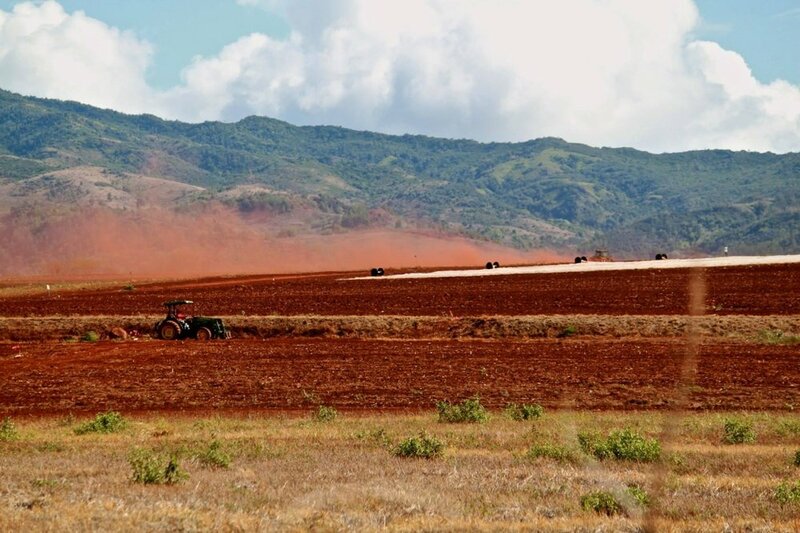 Additionally, YPDA Hawaiʻi supports the expansion of diversified, small-scale, local agriculture aimed at producing food for the people of Hawaiʻi in place of large-scale industrial, monocrop farms that are designed to test GMO-resistance to pesticides. While YPDA Hawaiʻi is not opposed to the science or technology behind GMOs, we believe this technology has thus far not been used in the best interest of the people of Hawaiʻi or of the world and call upon our legislators to regulate the agricultural and economic activities of these multinational corporations so that the best interests of the people are served. Recognition that climate change could have negative consequences for agricultural production has generated a desire to build resilience into agricultural systems. One rational and cost-effective method may be the implementation of increased agricultural crop diversification. Crop diversification can improve resilience in a variety of ways: by engendering a greater ability to suppress pest outbreaks and dampen pathogen transmission, which may worsen under future climate scenarios, as well as by buffering crop production from the effects of greater climate variability and extreme events. Such benefits point toward the obvious value of adopting crop diversification to improve resilience, yet adoption has been slow. Economic incentives encouraging production of a select few crops, the push for biotechnology strategies, and the belief that monocultures are more productive than diversified systems have been hindrances in promoting this strategy. However, crop diversification can be implemented in a variety of forms and at a variety of scales, allowing farmers to choose a strategy that both increases resilience and provides economic benefits. The challenges of pest suppression may intensify in the future as changes in climate affect pest ranges and potentially bring new pests into agricultural systems. It is expected that insect pests will generally become more abundant as temperatures rise as a result of range extensions and phenological changes. This abundance will be accompanied by higher rates of population development, growth, migration, and overwintering. Farmers may be able to assist in creating biotic barriers against new pests by increasing the plant diversity of their farms in ways that promote natural enemy abundance. The composition of the plant community, as determined by a farmer, may be described as the planned diversity of the system. Crop diversity is critical not only in terms of production but also because it is an important determinant of the total biodiversity in the system. Pesticides kill not only the pests but also the natural enemies of these pests. That means that natural control mechanisms are disrupted and it allows the pest populations to rapidly build up again to levels that can cause serious crop damage. The disruption of natural control can even create new pest problems. Minor pests that are usually kept at low numbers by their natural enemies will multiply rapidly in the absence of their enemies and cause outbreaks. So the control directed against one pests may result in the outbreak of another pest. The resurgence of pest populations after removing natural enemies creates a dependence on pesticides, which obviously is not sustainable. A key element of Integrated Pest Management (IPM) is therefore to avoid resurgence. Conservation of natural enemies is required so that natural control will not be disrupted. After World War II, when DDT and other organochlorine pesticides became popular in agriculture, they were considered a safe and effective way to get rid of pests. But over the years, more and more problems associated with the use of pesticides have shown up.One of the first discovered problems of pesticides was that pests can become resistant to these chemicals. Unaware of how to deal with this issue, farmers then decide to spray more frequently and to apply higher doses. This causes more problems. Within a pest population there is genetic variation in their resistance to pesticides. If pests have not been previously exposed to a new pesticide, most individuals in the population are susceptible, but some individuals are resistant. Pesticides that are used to control the pest will kill most of the susceptible individuals, but the few resistant individuals survive. In this way the proportion of resistant individuals in the population increases. Repeated selection of resistant individuals will make that every succeeding generation of the pest will have a higher proportion of resistant individuals than the original population. Eventually, after repeated and more intensive use of the same pesticide to the same pest population, the pesticide becomes ineffective. The use of pesticides (both synthetic and organic) always involves certain risks because of their poisonous character. Farmers and their family members run the highest risks. They can easily come in contact with the pesticides, for example when mixing the chemicals or when applying them to the crop. Additionally, the pesticides that were sprayed on the crop can leave behind residues that can enter the food chain. Pesticides will not only reach the target organisms, but will also kill other organisms (e.g. beneficial insects, birds, earthworms, fish) in or around the crop fields, causing loss of biodiversity, death of wild life and, potentially, the death of farm animals. Soil, air and water bodies can easily be contaminated with these poisonous chemicals. The unavoidable destruction of beneficial insects and spiders interferes with natural pest control. The mentioned risks are most obvious when pesticides cause acute toxicity to man, domestic animals and non-target organisms such as fish, bees, birds and soil organisms. The more subtle long-term chronic effects (disruption of endocrine system, cancer, sterility and mutagenic effects) often go unnoticed and are not yet fully understood. Also in the environment, some pesticides have not only acute effects but also long-term effects. Especially the “persistent organic pollutants” (POPs) will continue to poison non-target organisms in the environment and will also appear as crop residues long after their use has ceased. No pesticide, synthetic or organic, is considered “safe.” However, some are less dangerous to use than others, depending on their effect on living organisms. Farmers and consumers have to know how to reduce the risks and, to do that, disclosure of pesticide chemicals by the major agrochemical corporations must be mandated by the state. On August 25, 2014, the federal district court for Hawaiʻi vacated Kauaʻi County’s Ordinance 960, which imposed mandatory disclosure of certain pesticide use and the cultivation of genetically modified crops (GMOs). The law also imposed buffer zones prohibiting the use of certain pesticides within varying distances of neighboring properties. The Court’s ruling is important because it is the first major decision to address a county’s ability to regulate GMO cultivation and pesticide use. The court vacated the law finding that Hawaiʻi state law preempted the County Ordinance. Syngenta Seeds, Inc. v. Cnty. of Kauai, No. 14-00014 (D. Haw. Aug. 25, 2014). YPDA Hawaiʻi supports legislation at the state level aimed at reinstating these buffer zones across all four counties. In California, 1/4 mile buffer zones around schools were put in place in two of the state's agricultural counties (Tulare and Kern) when local residents documented contamination in school air using PAN’s Drift Catcher. The communities worked closely with Californians for Pesticide Reform to mount an effective campaign and win the protective buffer zones. There are two sides to the economics of pesticide use. Direct costs refer to buying the products, which requires investment by the farmers. While many will argue that pesticides are cheap, they form a major part of the farm inputs. Many farmers have become trapped in a dependence on pesticides. By using pesticides they have disrupted natural control, which results in more pests and which leads to more pesticide use. Indirect costs refer to all kinds of expenses related to pesticide use, most of which are paid by the government spending tax payers’ money. A hidden cost is all the medical costs related to health problems and accidental deaths as a result of pesticide use. Governments spend millions on laboratories for residue testing, laboratories for testing the quality of pesticides, field testing of pesticides, testing of side effects, etc. Other costs born by the government include: costs for staff involved in registration, labeling, inspectors for implementing legislation, disposal of obsolete pesticides, cleaning of contaminated sites, etc. Globally, the import of pesticides requires large amount of foreign currencies. The pesticide residue issue is becoming more and more important in world trade. This is a development which is likely to have an adverse effect on the export market for countries that rely heavily on agriculture as a major part of their economy. Did You Take Your Poison Today?